Not to be confused with United Kingdom football sexual abuse scandal. The 2016 English football scandal is a sports corruption scandal which began on 26 September 2016 following the publishing of the first part of The Daily Telegraph newspaper's "Football for Sale" investigation into corruption in English football. The scandal resulted in the resignation of England national football team manager Sam Allardyce after only one game in charge, as well as the sacking or suspension of numerous English Football League club staff, including Barnsley assistant manager Tommy Wright. On 26 September, The Daily Telegraph published footage filmed by undercover reporters in which then England manager Sam Allardyce is shown speaking with fictitious Asian businessmen, detailing how to get around FIFA and Football Association bans on third-party ownership of football players, before making derogatory comments about former England assistant manager Gary Neville and previous England manager Roy Hodgson. Allardyce subsequently spoke about HM Revenue and Customs, calling them the "most corrupt business in the world", Allardyce himself having been caught up in alleged tax fraud schemes in the past. Following the revelations by The Daily Telegraph, the FA and Allardyce agreed on 27 September for him to resign as England manager with immediate effect by mutual consent, with Gareth Southgate being named as caretaker manager. 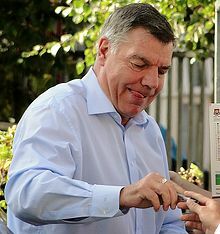 Following Allardyce's departure, The Daily Telegraph published further details of much wider-reaching corruption through English club football, claiming that eight Premier League managers accepted "bungs" for player transfers. On 27 September, The Daily Telegraph revealed that the Barnsley assistant manager Tommy Wright had taken a £5000 "bung" in order to arrange for the club to purchase part-owned players from a fictitious Far East firm. He was initially suspended by Barnsley as they launched an investigation into the allegations; he was sacked on 28 September. On 28 September, it was claimed by The Daily Telegraph that Queens Park Rangers manager Jimmy Floyd Hasselbaink had agreed to become an ambassador for a fictitious Far East sports company involved in third-party ownership of players in exchange for £55,000, subsequently also discussing potential tax avoidance involving his bank account in the Netherlands. Hasselbaink denied the claim, although he admitted he had been naive, and was supported by Queens Park Rangers after their internal investigation. Leeds United chairman Massimo Cellino was shown on video agreeing to sell 20% of the club in order to work around third-party player ownership rules. On 29 September, The Daily Telegraph released further footage from their investigation, alleging to show the assistant manager of Southampton, Eric Black, advising fictitious businessmen on how to bribe lower league clubs. Additionally, Jimmy Houtput, chairman of Belgian First Division B club Oud-Heverlee Leuven, allegedly offered his club as a "conduit" in order to aid third-party companies in gaining ownership of football players in England. Houtput resigned as OH Leuven chairman the following day. Then Wales manager Chris Coleman commented that corruption in the football industry should be punished by lifetime bans for the perpetrators. Former player and pundit Alan Shearer was particularly critical, claiming he "didn't think England could stoop any lower" following the England team's 1–2 loss to Iceland during UEFA Euro 2016 three months earlier, and called the team "a laughing stock of world football". ^ a b "Exclusive: How Sam Allardyce tried to make as much money as possible as England manager - before his first match". The Daily Telegraph. ^ a b "Tommy Wright sacked by Barnsley for accepting £5k cash 'bung' following Telegraph investigation". The Daily Telegraph. ^ "Exclusive: Sam Allardyce mocked predecessor Roy Hodgson - and hit out at Gary Neville". The Daily Telegraph. ^ "Exclusive: Sam Allardyce claimed HMRC is the 'most corrupt business' in Britain". The Daily Telegraph. ^ "Exclusive: Eight Premier League managers accused of taking transfer bungs". The Daily Telegraph. ^ "How Barnsley assistant manager Tommy Wright took £5k bung to help agents place players at his club - then took part in bizarre meeting". ^ "QPR manager Jimmy Floyd Hasselbaink asked for £55k to act for sports company that proposed selling players to his club". The Daily Telegraph. ^ "Jimmy Floyd Hasselbaink: QPR back manager over Daily Telegraph claims". BBC. ^ "Leeds United owner Massimo Cellino offers to sell 20 per cent of club to help 'businessmen' get round third party rules". ^ "How Southampton's Eric Black advised 'businessmen' how to bribe lower league staff to get players for fictitious agency". The Daily Telegraph. ^ "Belgium football club offered itself as a conduit to help a fictitious investment firm get around third party ownership - against FA and Fifa rules". The Daily Telegraph. ^ Tom Morgan and Christopher Hope. "Chris Coleman: We belong to an industry where there is corruption - ban corrupt managers for life". The Daily Telegraph. Retrieved 29 September 2016. ^ "Sam Allardyce: England a laughing stock - Alan Shearer". BBC Sport. Retrieved 18 October 2016. This page was last edited on 8 March 2019, at 02:06 (UTC).